Successfully Added HK Warehouse Blackview BV7000 Pro Android Phone - 4G, Dual-IMEI, Octa-Core CPU, 4GB RAM, Android 7.0, IP68 (Gold) to your Shopping Cart. 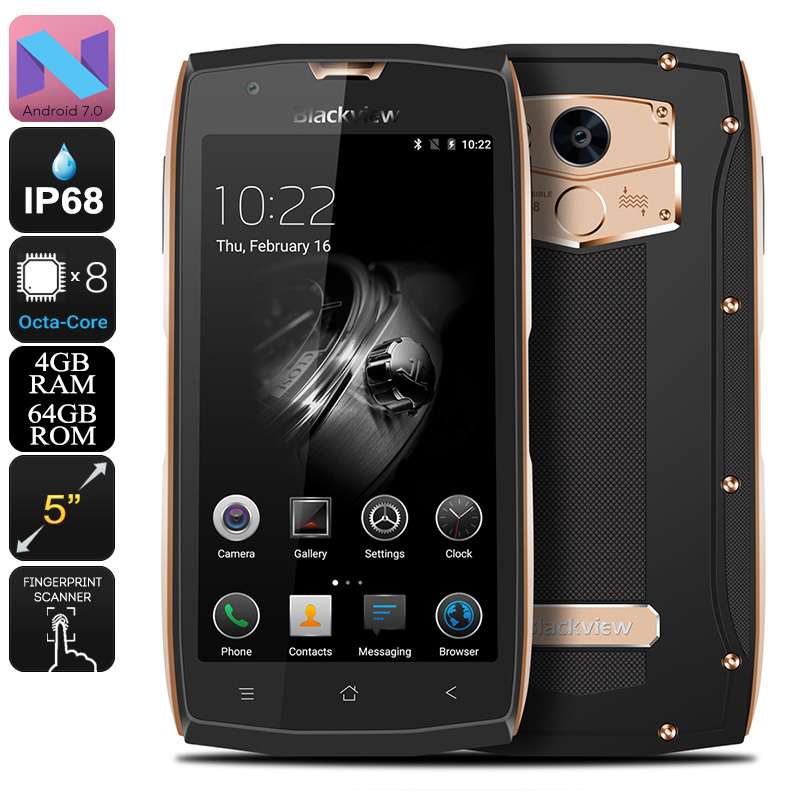 The Blackview 7000 Pro is the ultimate Android phone for those of you that are searching for a durable smartphone that features the latest specs, yet comes with a remarkably low price tag. Available for less than 200 Dollars, this mobile phone certainly is a bargain. Running on an Android 7.0 operating system, this Chinese smartphone comes packed with the latest software features. Its smooth and powerful performance is guaranteed to deliver an outstanding user experience – putting a smile on the faces of even the most demanding smartphone users out there. Whether you’re into games, Apps, movies, or simply like to browse the web and make calls – this Android mobile phone is sure to meet all your smartphone demands. Packing a stunning 5-Inch Full-HD display, this Android phone brings along great 1080p visuals for you to enjoy while watching the latest movies or series on your mobile phone. The Blackview 7000 Pro furthermore features a sophisticated Octa-Core CPU that has been clocked at 1.5GHz and 4GB RAM – allowing you to play graphically demanding games, watch the latest movies, and browse the web without dropping a frame. With access to the Google play store, this phone provides you with an unlimited pool of free mobile entertainment – guaranteeing that you’ll never have to feel bored again. It additionally comes with 64GB of internal memory and a 32GB SD card slot, providing you with all the storage space needed for your media and files alike. Besides its powerful specs, this Android phone furthermore features Corning Gorilla Glass 3 and a tough IP68 body that’s resistant to water, dust, and drops. With this durable mobile phone at your side, you’ll be able to enjoy all the latest features and stay connected to friends and family wherever you are. With its Dual-IMEI numbers and 4G network support, this waterproof cell phone allows you to browse the web at lightning speeds and guarantees that you’ll always be able to stay in touch with your loved ones at any time. At the rear of this sleek Android smartphone, you’ll be able to find a breathtaking 13MP camera that truly brings your smartphone photography to the next level. Letting you shoot Full-HD video and stunning pictures of all these special moments in life – you can be assured that with this camera at your side never again a memory will be forgotten. The phone furthermore packs an 8MP front camera, perfect for all selfie lovers and for those of you that like to engage in online video calls.